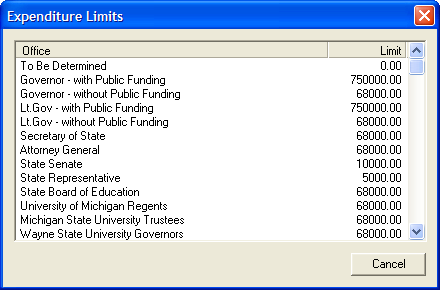 The MERTS software uses a chart of limits that it references to determine if a contribution received or an expenditure made exceeds the limits provided by statute. A warning of potential excess contributions or expenditures will be displayed. For the software to perform, the entity types selected in the Names tab must be correct. Under the Edit menu select the Contribution Limits option. The Contribution Limits chart will open. Candidate Committees: Chart displays the contribution limits for each office sought. ** A Senate or House Caucus committee is prohibited from making a contribution to or an expenditure on behalf of a State Representative or State Senate candidate if the candidate is running against opposition in a primary. PAC and Political Party Committees: Chart displays the expenditure limits for contributions to Candidate Committees. (**) NOTE - The amounts do not represent current contribution limit thresholds.